It’s the little things in life that make me smile. I walked in to Starbucks this morning, my home away from home, and discovered that xmas drink flavors are back! 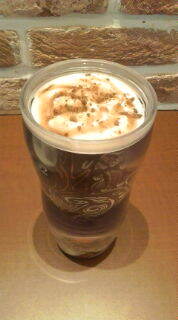 I chose to sample the brand new Caramel Eclair Latte (which is delicious! ), but I was also happy to see that my old favorites, the Dark Cherry Mocha and Gingerbread Latte are back. There’s something so familiar about seeing the red cups in Starbucks at xmas time. Sipping coffee while listening to xmas classics. I know some would say it’s too early but, as far as I’m concerned, it’s never too early for xmas in Starbucks!